Most people know about Radha, who is said to be Krishna's lover and his favorite among the Gopis, whom Krishna spent time with during his childhood in Vrindavan and Gokulam. Yet the Sri Vaishnava sect (of which I'm a member) doesn't emphasize Radha. In part that's because Sri Vaishnavas focus on the Vishnu Purana and the Srimad Bhagavatam, neither of which even mention Radha's name. But as I discuss in this question, Sri Vaishnavas do recognize a figure similar to Radha, known as Nappinnai. Nappinnai was the daughter of Yashoda's brother Kumbhaka. Krishna married Nappinnai after defeating the seven ferocious bulls of Kumbhaka. 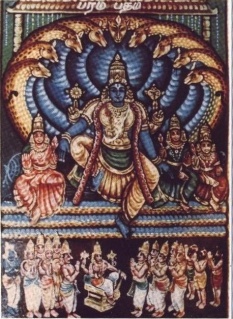 The story of Nappinnai is described in the Harivamsa, the Garuda Puranas, and in the poems of the Alwars. But my question isn't about Nappinnai herself, but rather about the goddess she's an incarnation of. Most people only know about Vishnu's wives Lakshmi goddess of wealth and Bhumidevi goddess of the Earth, commonly known as Sri Devi and Bhu Devi. But the Sri Vaishnava sect believes Vishnu has a third wife, known as Nila Devi. It was Nila Devi who took an incarnation as Nappinnai, as well as a bunch of other incarnations which I may discuss in a future question. Be the bounteous region rich in milk, for us. The winds blowing together be gracious to us. May Aditi be auspicious to us in her life. Now as I discuss in this answer, how the Vedas originated is that from time immemorial, sages known as Drishtas heard sacred verses directly from the gods in a state of Tapasya, and then in the Dwapara Yuga those verses were compiled by the sage Vyasa into the four books we call the Vedic Samhita. So my question is, who is the sage who heard the Nila Sukta from the gods? Information like who heard what verse of the Vedas from the gods is found in the Anukramanis (indices) of the Vedas. I compiled Anukramani information for the Rig Veda Samhita in my answer here, and I requested the Anukramani for the Shukla Yajur Veda Samhita here. But does anyone know if the Anukramani information for the Krishna Yajur Veda Samhita, i.e, the Taittiriya Samhita, is available online in English? That would also help me answer my question here about another hymn of the Krishna Yajur Veda. Browse other questions tagged mythology vishnu vedas sri-vaishnava yajur-veda .